Motivation without information? Inspiration without an action plan? 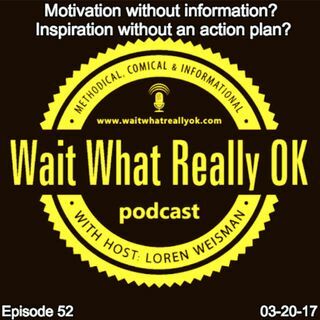 Wait What Really OK Podcast Episode 53 hosted by Brand Precision Marketing Strategist and Counselor, Loren Weisman revisits the life coach problem and the problem that so many life coaches are causing those that buy in to their pitches. Its the new magic elixir and yet as old as the earliest self help books, these life coach, business coach types that have all the answers to business, while never having been successful ... Más informaciones in business themselves. There are a select few that motivate as they inform and inspire as the direct. These are the ones to look to, connect with and work with. Just take the time to research those that claim to have all the answers and look for how they have applied those answers for others and themselves. Motivation without information? Inspiration without an action plan? Ep 53 of the Wait What Really OK Podcast is available on iHeartRadio. Podcast Blog Supplement for Episode 53 of the Wait What Really OK Podcast with Loren Weisman. Podcast Link Supplement for Episode 53 of the Wait What Really OK Podcast with Loren Weisman. How can you expect someone to deliver undefined deliverables? Podcast Video Supplement for Episode 53 of the Wait What Really OK Podcast with Loren Weisman. Podcast Photo Supplement for Episode 53 of the Wait What Really OK Podcast with Loren Weisman.